De Rosa gives a fictionalized account at what would happen at the death of Pope John Paul II. This book was published in 1997, before the death of Pope John Paul II, so it's especially interesting to read now what De Rosa thought would be. In his story Islamic Fundamentalists play a huge role in the world and the Catholic Church struggles with issues such as celibacy/marriage and usury interest/banking. The Pope who succeeded John Paul II didn't meet anyone's expectations completely. Reading this book, I felt that De Rosa was a sincere Catholic Christian who acknowledged the foibles of his church's ways. Very funny and insightful book. What if someone who actually followed Jesus Christ's teachings and spirit became Pope?Funny, biting, challenging, baffling (to someone outside Christian religion but with a mother who was a Catholic), uncompromising challenging (while it takes apart the Catholic Church's rotten structure - abortion is murder in this book). A great packed book. Very religious in the best sense. Felt shaky about the Muslim sections at first (written pre-911) but thought de Rosa pulled them off well. I usually do not re-read books. I was making an exception as a) I had just finished reading the Doomsday Key from James Rollins with its mention of the Malachy prophecy of the popes and b) the new "APOSTOLIC EXHORTATION EVANGELII GAUDIUM" from Pope Francis and c) the negotiations with Iran reminded me of Pope Patrick. The book is from 1996 but takes place in 2009.The book was enjoyable in various different ways. My favourites included when the pope starts to fix bicycles and they end up on auctions, the pilgrimage to Ireland where the cardinals are moved outside their comfort zones, and of course, the interactions with Charlie his dog and his cat. There's a history lesson about the Irish and the treatment they received from the British - ouch. Patrick's evangelii about the poor and evil of interest is essentially a declaration of war to the western world; well, especially the point where paying interest is a sin which a good catholic can not do. I pray for Pope Francis' health and long life. Although, his evangelii is much more balanced and seems to bring a moral pillar to a capitalist system, it has also brought attacks based on fear and misunderstanding. It has also elevated the discussion about the poor and economic inequality and that has been a welcome focus for the vatican. An intriguing concept, a speculative novel about the possible successor (in 2009) after the death of John Paul II. An unassuming Irishman is elected to the papacy after a deadlock, and proceeds to make sweeping changes in the Church. 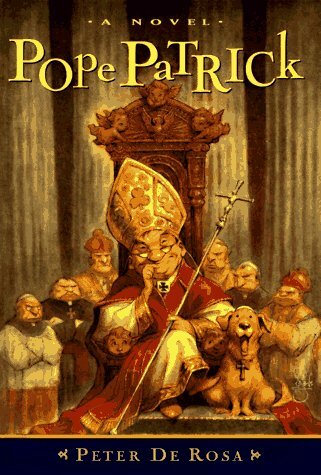 Written from a perspective of Ireland (published in Dublin, 1995), this book was certainly known by former U.S. ambassador to the Vatican Raymond Flynn when he wrote "The Accidental Pope" in 2001, since they have a similar theme -- essential unknown is elected to the papacy. I this book, Pope Patrick startles everyone, including the Curia, by his views on priestly celibacy, contraception, world economics and nuclear weapons. Of course, it's wild speculation, but at heart, Peter de Rosa has some very good insight into the Vatican and the workings of e church, so it's fun for someone like me who works in the church to see how his perceptions shape the story. It's also interesting to read in light of the election of Pope Francis.Good, but not great. A fun summer read.BTW, this copy is signed by the author. Memorable.Set in close future - 2010 or so. An Irish man is elected Pope. He turns the church and the world on its ear with his pronouncements. The FAR Federated Arab Republic is the U.S. enemy and they have nuclear weapons.Right after his election he is hit on his head by a pillar. Is he crazy?Pope is very holy and sells the Pieta to feed the poor. Patrick says priests can marry, no birth control, no lending money with interest.Well written. In the end the FAR unleashes nuclear war. Patrick dies and the world ends.Once they slit the camel's throat, that is the end.One message among many - don't let the Arab countries unite. I first picked up Peter de Rosa's book because of the tagline: 'The first man to win the Triple Crown for Ireland.' I was surprised by the gentle satire and genuine heart of the story, as well as the emotional impact of certain scenes. I get the feeling that there's something special at work here, a delicate nuance that keeps the satire sharp without dipping too much into cynicism. Patrick is an honest fool, yet filled with a strange wisdom and, given the opulence of the Catholic Church - despite its message of humility, the image of a threadbare Pope mending bicycles is a heart-warming one. I feel a bit guilty for liking this book so much since I can see how a non-Catholic, particularly a Muslim, would be offended by some of the passages in the novel. But for all its stereotypical depictions of certain characters, it's still fun to read. Was expecting a satirical farce, it's premise was good but book didn't deliver! Well I thought I would like it more when I first started it, but by the end so-so. Kind of a wacky read, but fun. Imagines what would happen if the Pope was a slightly addled Irishman. My favorite character was Charley! He should have been elected Pope. Peter de Rosa - De Rosa is a writer of both fiction and non-fiction, focusing on Catholic and Irish history. He was ordained a Catholic priest in 1956 but left the priesthood in 1970, after which he became a Staff Producer for the BBC and then a full-time writer. After living for thirty years in County Wicklow, Ireland, Peter now lives in Bournemouth, England.